The CLA-Class is another Mercedes-Benz niche category which attempts to mix sport car styling and handling with a practical sedan body style. While looks are a subjective thing, most find the shape a little challenging from certain angles. Interior quality levels and available options do however make for a compelling luxury sedan and for 2018 the CLA continues largely unchanged. The general material quality and fit and finish of the panels is as good as you would find in far more expensive Mercedes products, the dashboard is well crafted and other than the seemingly tacked on infotainment screen, all the controls and buttons are pleasant to use. Where the compromise comes in is in the cabin space, occupants up front will have no issues with getting comfortable although the seats are not quite as good as in the C-Class. The passengers in the rear will find it a bit more claustrophobic though, the steeply angled rear screen and tight leg room makes the rear seats most suitable for children. The trunk makes up somewhat for the cramped interior with a wide opening aperture and enough cargo capacity for most needs. 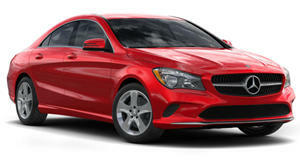 The sporty suspension and sharp steering feel give the CLA an eager character when pressing on. The transmission shifts rapidly between cogs in these situations and it tackles corners with aplomb. The cabin is as muted as you would expect in a Mercedes and on standard alloys and tires it absorbs most bumps and road imperfections without too much drama, although bigger bumps do unsettle the car. Equipped with the larger diameter alloys the ride may get a bit too firm and road noise on wider tires will also be magnified. The CLA 250 comes equipped with a 2.0-liter turbocharged inline-4 engine with peak outputs of 208 horsepower and 258 lb-ft of torque. The 7-speed dual-clutch automatic transmission powers either the front or all four wheels in the 4Matic variant. 0-60mph takes a competitive 6.9-seconds to complete (6.8 in the 4Matic) and the CLA feels sharp and responsive when overtaking maneuvers are required. It is slightly less happy when pulling away from the lights or when gentle acceleration is required as the dual-clutch transmission can feel a bit lazy to react. Basic specification levels in both the CLA250 and 4Matic are identical and some notable features include MB-Tex interior upholstery, 14-way power front seats with memory function, 17-inch alloys and climate control. There is also an 8-inch infotainment system with integrated Bluetooth connectivity and two USB ports. A rearview camera, forward collision mitigation, active brake assist and drowsy driver warning system aid safety levels. An available Driver Assistance Package includes adaptive cruise control and lane keeping assist. A Premium Package includes blind spot assist, keyless go, heated front seats and hands-free access. The Convenience Package includes auto-dimming driver and interior rearview mirrors, a compass and a garage door opener. The Smartphone Integration Package is also worth a look as it offers Android Auto and Apple CarPlay functionality. There are also three packages that offer various AMG body styling details, larger alloys and exterior and interior sporty accents. A number of items can be had as standalone additions such as adjustable suspension, parking pilot, panoramic sunroof, LED head and taillamps, rear spoiler, keyless go, upgraded audio system, heated front seats and navigation. The CLA250 occupies the niche ‘luxury sport sedan that looks like a coupe’ segment and while it undoubtedly adds a dash of style and drama to what would otherwise be just another compact sedan, the packaging does compromise interior space. Strong performance and a luxurious interior are countered by a ride that can get a bit fidgety and a transmission that does not always perform at its best in city driving conditions. It’s worth a look but there are some strong competitors out there that offer a more balanced package.